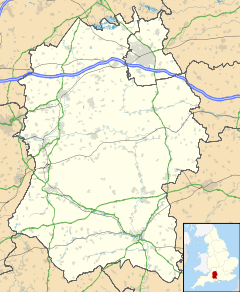 Marston Meysey, pronounced and sometimes also spelt Marston Maisey, is a village and civil parish in Wiltshire, England, lying 3 miles (5 km) northeast of Cricklade on the county boundary with Gloucestershire. The parish includes the hamlet of Marston Hill. The village has a pub called the Old Spotted Cow, and not far away is RAF Fairford. The nearest major town is Swindon. Marston Meysey was part of the hundreds of Highworth, Cricklade and Staple and of the diocese of Gloucester. The population was 240 in 1831, but only 185 in 1951. A chapel of ease was built by the de Meysey family in the late 13th century, and a new chapel in 1648, which was in disrepair by the 1870s. In 1869 the Rev. W. H. Ranken became Rector of St Mary's in Meysey Hampton and Vicar of Marston Meysey, and soon mounted a public appeal for funds for new buildings. Money collected, mainly within Marston Meysey, paid for a new church, a vicarage and a Church of England school. The church of St James was completed in 1876 to designs of James Brooks and is Grade II* listed. The school was closed in 1924, as the number of children had fallen to eighteen, and since then the old school building has been used as a village hall. It is now a Grade II listed building and is owned by the village. The River Thames forms most of the southern boundary of the parish, and a small tributary is the entire western boundary. The Thames and Severn Canal, completed in 1789 and abandoned between 1927 and 1941, crosses the parish south of the village. A three-storey circular lengthsman's cottage survives at Round House Farm alongside a bridge, a short stretch of water and vestiges of a lock. The first tier of local government is a parish meeting at which all electors may vote. Most significant local services are provided by Wiltshire unitary council. At the parliamentary level, the parish is part of the North Wiltshire county constituency and its current member of parliament is James Gray (Conservative). ^ "Wiltshire Community History - Census". Wiltshire Council. Retrieved 23 December 2015. ^ Historic England. "Church of St James, Marston Maisey (1023152)". National Heritage List for England. Retrieved 23 December 2015. ^ Historic England. "Village Hall (former school), Marston Meysey (1390811)". National Heritage List for England. Retrieved 23 December 2015. ^ Historic England. "Round House, Marston Maisey (1198062)". National Heritage List for England. Retrieved 23 December 2015. ^ Historic England. "Marston Meysey Bridge (1023150)". National Heritage List for England. Retrieved 23 December 2015. ^ "Marston Meysey Parish Meeting". Wiltshire Council. Retrieved 23 December 2015. Wikimedia Commons has media related to Marston Meysey.